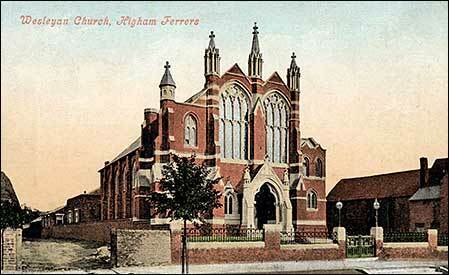 On Wednesday morning a quiet but attractive marriage ceremony took place in the New Wesleyan Church at Higham Ferrers. Both parties are well-known and respected in Rushden and Higham, the bride being Miss Ann Cooper Watson, eldest daughter of Mr. Thos. Watson, engineer and manager to the Rushden and Higham Gas Co.; and the bridegroom the Rev. T. Edwards Thompson, Wesleyan minister, Wakefield, who was formerly one of the ministers of the Rushden Circuit, removing to Leicester in September last. A good number of friends assembled in the chapel to witness the wedding, which was conducted by the Rev. G. H. Hayes) superintendent minister), assisted by the Rev. John Grimshaw, superintendent of the Gravel-lane Wesleyan Circuit, Manchester, and an old Gibraltar friend of the bride’s father. The bride, who was given away by her father, was attired in white Japanese silk, and wore a white hat, trimmed with ostrich feathers and orange blossoms, also carrying sprays of lilies of the valley and roses. She was attended by four bridesmaids, these being Miss Christian M. Watson (sister of the bride), Miss Alice P. Michell, Miss Grace Rundle Watson, and Miss Helen Watson (sisters). All were dressed in grey Sicillean, with large white picture hats, trimmed with grey silk, and carried sprays of lilies of the valley. Mr. Alf. Thos. Watson (brother of the bride) discharged the duties of best man. A number of guests were afterwards entertained at the house of the bride’s parents, and later in the day Mr. and Mrs. Edwards Thompson left for Ashover, Derbyshire, where the honeymoon is to be spent. Mrs. Thompson’s travelling dress was of fawn serge, trimmed with brown silk. Both carry with them the best wishes of numerous friends, tokens of good-will having been received in the shape of a handsome collection of presents.